Gently prick the eggs with fork, add 1/2 tsp turmeric powder , 1/2 tsp red chilli powder and 1/2 tsp salt, mix it. In a blending jar: add ginger, garlic, onions and tomato and little water, blend it into thick smooth paste. Heat a pan, add little cooking oil and let the oil heat, put the marinated boiled eggs in the pan one by one. Fry the eggs on medium flame for 2-3 minutes, take out the fried eggs in a plate. Heat the same pan and add cooking oil, let the oil heat, add cumin seeds, bay leaves and fry it for few seconds. Add onion cubes, fry the onions for a minute on medium flame. Add turmeric powder, red chilli powder and chicken masala powder in the pan, mix it and fry it for a minute. Add blended masala paste, fry the masala for 2-3 minutes on low-medium flame,keep stirring in between. Add 1/2 glass of water and salt to taste, stir it and let the curry boil. 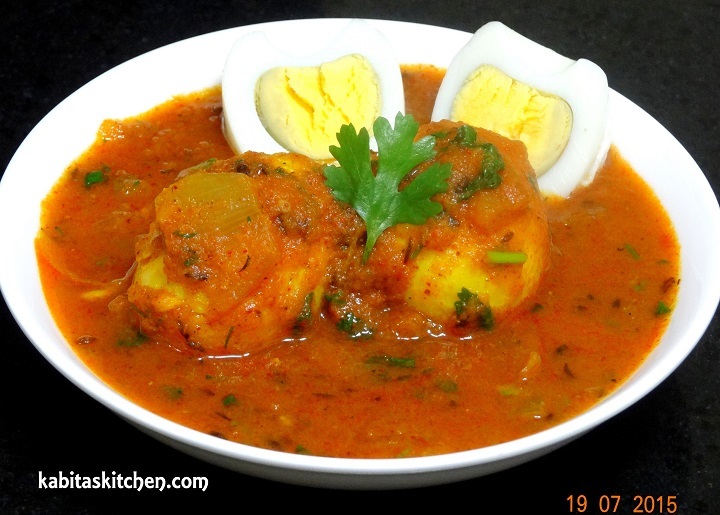 Put the fried eggs in the curry one by one, add garam masala powder and stir it. Reduce the flame to medium and cook it for a minute (cover the pan). Ready to serve with roti, paratha and rice etc. Soya chunks -25 gm (Soak in hot water and squeeze it to drain the water). In a blending jar: put all the masala paste ingredients (mentioned above). Add 3-4 tbsp water and grind it into paste. Add washed rice, 4 green cardamom, 1 black cardamom, 1 javitri, 1 inch cinnamon stick , 1/2 tsp salt. When the rice starts boiling, check the rice, it should be 70% cooked. 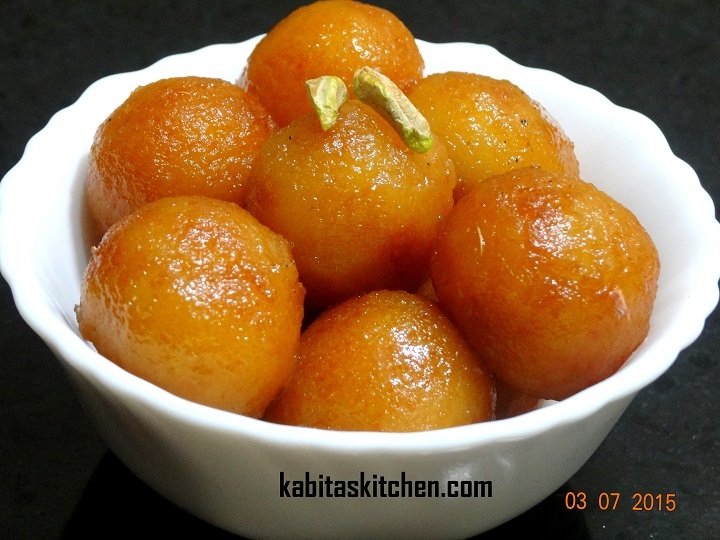 Heat oil in a pan, add shahi jeera(recommended) or plain jeera and fry it for 20-30 seconds. Add potato, cauliflower and carrot, fry for 2 minutes on medium-high flame. Add green peas, paneer and soya chunks, fry for 2 minutes on medium flame. Add chopped french beans, prepared masala paste and cook it on low flame for 2 minutes. Add salt to taste, mix it well, cook it for 1 minute on low flame and turn off the flame. Take a deep and thick bottom pan, put the fried vegetables on the base of the pan. Add yoghurt, turmeric powder, red chilli powder, garam masala powder, biryani masala powder and green chilli. Put 1/3 of the fried onion on it, coriander leaves, mint leaves and 2 tbsp ghee, mix it well and level it evenly. 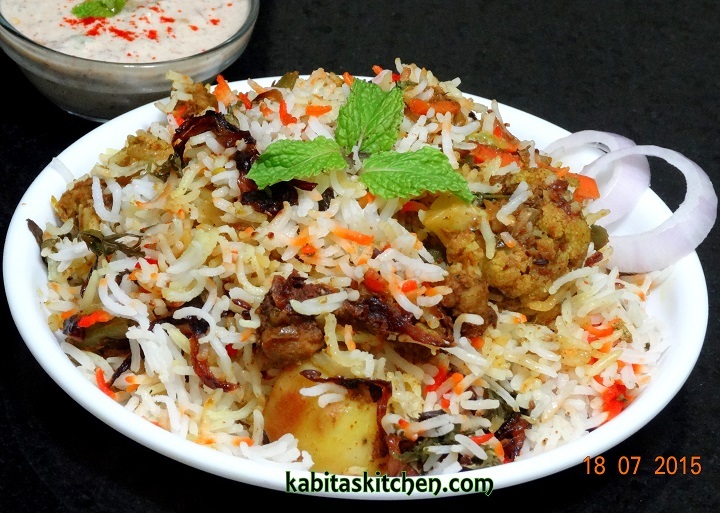 Put 2/3 of the rice on it and spread it evenly, add 1 tbsp ghee, sprinkle 1/2 tsp of food colour. 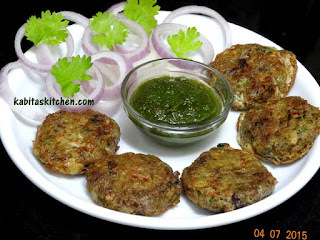 Add 1/3 (half of the remaining fried onion) of the fried onion, coriander leaves and mint leaves. Put the remaining rice on it, add 1 tbsp of ghee and saffron soaked milk on the half part of the rice. Add 1/2 tsp food colour on the other part of rice ( you may add kewra water and rose water for restaurant style aroma). Sprinkle remaining coriander leaves, mint leaves and fried onion. Seal the edges of the pot with foil paper, put a heavy tawa/lid on top of the sealed pot. Turn on the flame and put the biryani pot on it, cook it on medium flame for 8-10 minutes. Reduce the flame to low-medium and cook it for 10-12 minutes. Cook it on tawa for 10-12 minutes on medium flame, turn off the flame. Remove the foil paper carefully to avoid the steam. 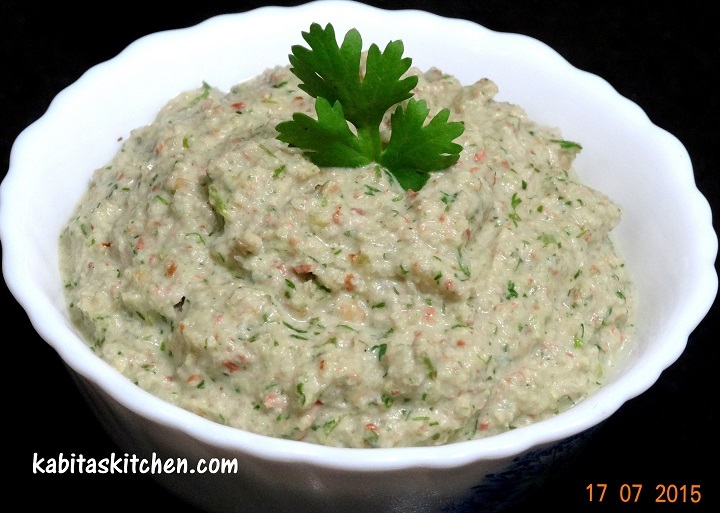 Ready to eat with raita or any of your favourite gravy. Add 1/3 quantity of the chopped onions at a time, fry it on medium high flame for a minute. Simmer the flame to medium and fry it till it turns golden brown. 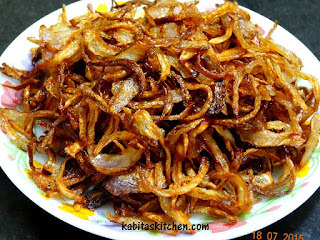 Fry the remaining onions in the same way. Fried onions is ready for biryani or pulav. Heat a pan, add oil and let it heat. Add chopped onions and fry it on the medium flame till it turns soft. Crack the eggs in a bowl, add little salt and whisk it. Add egg in the pan and fry it for a minute, stir continuously. 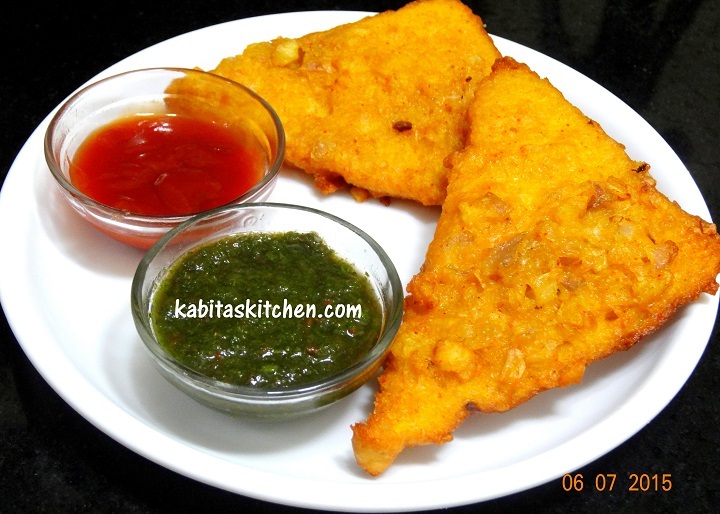 Take one slice of the bread, apply green chutney on it. Take another slice of the bread and apply tomato ketchup on it. 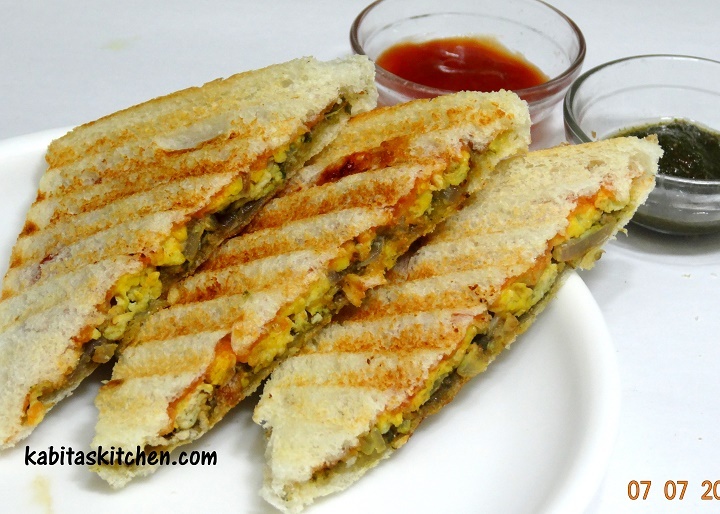 Put egg bhurji on one slice(chutney coated slice) and grate some cheese over the egg bhurji. Place the other slice on it, keep it aside. Prepare other sandwich using same process. Place the sandwiches in the sandwich maker, grill it. Take out the sandwiches in a plate, cut it diagonally. 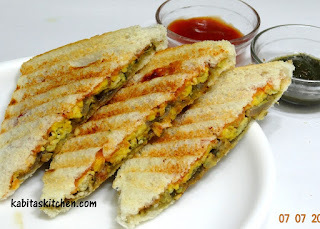 Egg bhurji sandwiches are ready to serve. Mix all the ingredients into the paneer except cheese and oil, mix it properly. Take a small portion of mixture, roll it and press it on your palm like tikki(make it flat). Stuff one cheese cube inside, seal the edges and make a ball by rolling it on your palm. Repeat the same process to make balls from remaining mixture. Turn on the flame and heat a pan, once the oil is heated, put the balls into the hot oil one by one. Fry it on medium flame till it turns golden brown from all sides. Wash the bringal and cut it into thick slices. Mix all the ingredients in the bringal except cooking oil. 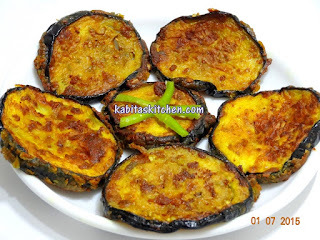 Coat brinjal slices with masala properly and leave it for 10 minutes. Turn on the flame and heat a pan, add 2-3 tbsp cooking oil and let the oil heat. Place the masala coated bringal slices into the pan. Fry it from both sides on medium flame till it turns golden brown. Keep turning sides to cook it evenly from both the sides. In a bowl: mix all the ingredients except bread and oil. Add one cup of water, mix it and make a thick batter. Add cooking oil and let it heat properly. 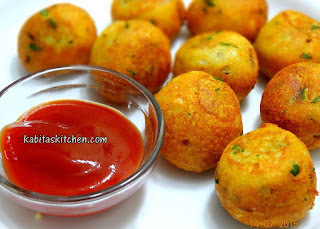 Dip the bread slices in the batter and put it into the hot oil. Fry it for a minute then gently flip it to fry other side. Fry it till it turns golden brown from both sides on medium heat. Wash and dry the bhindi, slit it for stuffing. In a bowl: Mix all the ingredients except bhindi, cumin seeds and oil (do not add water). 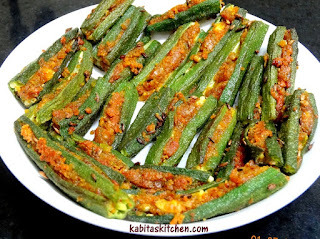 Gently stuff the bhindi with prepared masala one at a time and keep it aside. Heat a pan, add cooking oil and let it heat. Add cumin seeds and fry it for few seconds, simmer the flame. Add the stuffed bhindi one by one in the pan. Cover the half of the pan and cook it on low flame for 6-8 minutes. Keep stirring or tossing in between. Cover the pan and cook it for a minute on low-medium flame. Fry it for 30 seconds on high flame to make it crispy, keep tossing/stirring. Add cardamom powder, boil it for another 15 mins, Stir in between. Cut the papad into two pieces and roast it on tawa on medium flame from both sides. Take out on the kitchen towel and immediately roll it into cone shape. Repeat the same process for remaining papad cones. Mix all the ingredients together except papad cone. 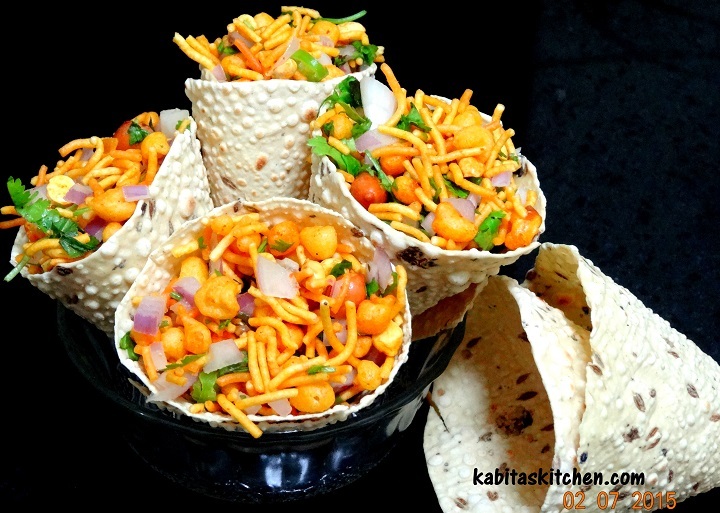 Fill the papad cone with prepared mixture one by one.